Looking to experience something different other than your ordinary Las Vegas wedding? Las Vegas and surrounding areas offer a host of interesting locations which provide for great photo opportunities. Some of our favorite locations include the Pahrump Valley Winery, the Valley of Fire, Nelson's Landing - El Dorado mine, Red Rock Canyon National Conservation Area, Floyd Lamb Park and Lake Las Vegas. Red Rock Canyon is located 15 minutes outside of Las Vegas. Pahrump Valley Winery - Just outside of Las Vegas over the hump to Pahrump there is a beautiful winery which is available to couples for weddings, either elopement or large parties. They also have a fantastic restaurant for receptions and there is free wine tasting. We photograph weddings there all the time and it offers a wedding adventure for our couples. Pauls's Vegas Photography enjoys shooting at this beautiful winery. Nelson's Landing - El Dorado Mine Weddings are a fun adventure an hour from the Las Vegas strip. You can have a large party or a small elopement with lots of locations and backgrounds. For the more adventurous you can do a wedding ceremony inside the mine, which stays at a comfortable 68 degrees most of the year. Nelson is a good choice for Old Nevada experience. Valley of Fire is a beautiful natural wedding location featuring alot of red rock formations, hence the name Valley of Fire. 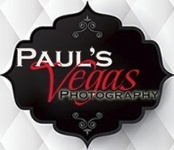 Paul's Vegas Photography has shot a number of weddings in the Valley of Fire and can capture beautiful memories. It's about a 90 minute drive North of Las Vegas, Nevada. Red Rock Canyon is 15 minutes outside of Las Vegas and offers two locations for weddings and other locations for photography. You must have a permit to do a wedding there and we can help you obtain one. Not having a permit there can ruin a special day. If you have any questions about this location feel free to call and we can discuss Red Rock Canyon for your wedding. Lake Las Vegas has a number of venues however they can be costly. There are boats were small elopement parties can perform a wedding ceremony on and then party and take pictures in the Village. If you are interested in a boat wedding we can help. Tule Springs - Floyd Lamb Park is a oasis in the North part of Las Vegas about 30 minutes from the strip and offers a number of locations and has 6 small ponds. It is inexpensive to enter the park and no City permit is needed for small groups. This is our go to place when budget is an issue.